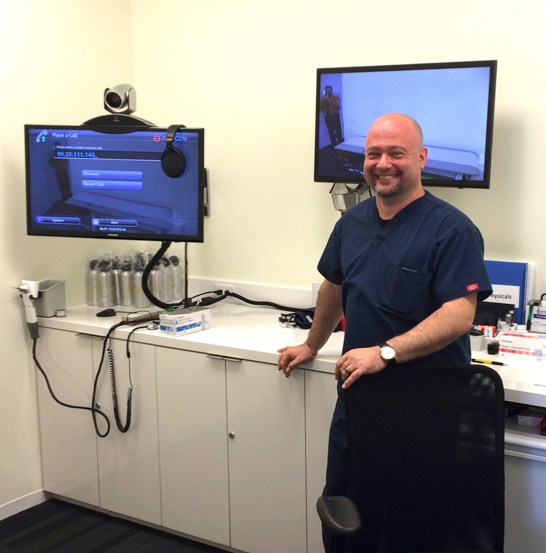 Affordable, on-site mini-clinics for healthier, happier, more productive employees. Medicine At Work™ manages employer’s rising healthcare costs through advanced medicine and worksite clinics. Our Board certified physicians and medics provide everything from immediate non-emergency care (with prescriptions) to health management programs. Take charge of your employee wellness, productivity, and morale, while saving time and money. Convenient, inexpensive access to doctors improves health outcomes and reduces cost. Keeping employees out of emergency rooms and urgent care clinics when not necessary saves time and money. Large hospitals excel at solving dangerous and complex health conditions. They fall short in providing simple episodic care, managing health, and controlling an employer’s cost. We exist to fill this gap efficiently and inexpensively. It is well recognized that today’s health care and insurance system is focused on correcting problems late in the game rather than preventing them or catching them early. More employers are engaging on-site clinics for convenient preventative services, or telephone telemedicine services for simple complaints. Now employers can get the best of both approaches through Medicine At Work™. Healthy and happy employees means better productivity. Work-site clinics are a tool to contain the relentless growth in medical costs, but many employers also seek to boost employee productivity and enhance companies’ reputations as employers of choice. Medicine at Work™ is unique in its ability to deliver cost-effective options for smaller employers and more efficient options for larger employers. 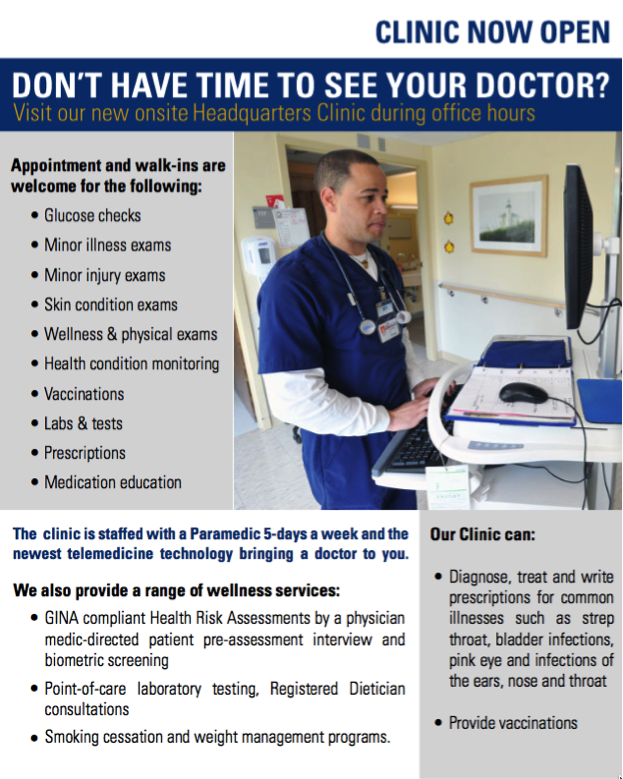 We staff a dedicated medic at your site to facilitate doctor visits and provide prevention and wellness services. These services include Health Risk Reviews to determine at-risk conditions of current employees. For significant cases, physicians can offer advice for improvement options. Also included are a weight management program and general coaching advice on nutrition and exercise. Employees get personal attention from a friendly, approachable team member for improved health through one on one coaching with weight management and other health monitoring. Selected on-site laboratory services are available, as well as Flu shots and other common adult immunizations. At your mini-clinic, Medicine at Work™ can address 95% of conditions treated at regular physician offices, prescribe specific medications for conditions, and provide individualized treatment follow-up with the same physician. Prescriptions are written when needed, using your employee’s regular pharmacies or PBM services. We use an advanced telemedicine system for medical care that is fully compliant with all state Board of Medicine regulations. 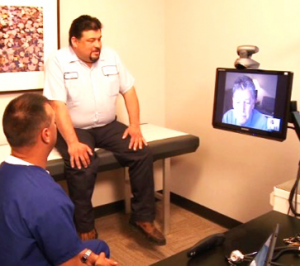 We use professional grade two-way video-conferencing combined with the medic using exam tools that allows for a diagnostic exam by the consulting physician. Employees get fast, convenient physician care with less time away for doctor visits and fewer insurance claims from office visits, urgent care, and ER visits. Integration with other medical care. How does Medicine At Work™ interface with the employee’s regular doctor? 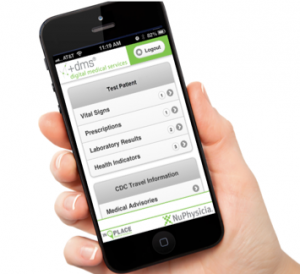 The NuPhysicia NuChart™ phone or tablet App for iPhone™ and Droid™. Each patient is offered a logon (use is optional). NuChart™ provides important summary information from clinic visits such as diagnoses, medications, vital signs (like blood pressure and pulse rate), lab results, and other health indicators. It provides handy reference for patients watching their blood pressure, weight, or other laboratory results. Patients can view data on their phone, show the data to their regular doctor, or email themselves summaries of their data that can then be shared to their doctor. NuChart™is HIPAA-compliant and secure, and is a free download. 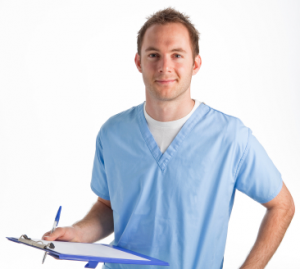 Our focus and goal is to improve the health care of your employees, while also saving you as much money as possible. Not only do we provide everything for the clinic, we also provide materials and assistance so that you can market your clinic internally, drive utilization, and maximize success.